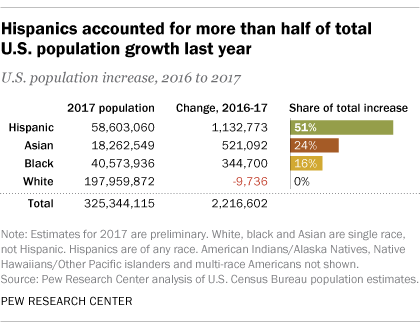 The annual growth rate of the U.S. Hispanic population remained flat between 2016 and 2017, but Hispanics continue to account for more of the nation’s overall population growth than any other race or ethnicity, according to a new Pew Research Center analysis of preliminary population estimates from the Census Bureau. Asians had the highest annual growth rate (3.0%) of any major U.S. racial or ethnic group in 2017. The Hispanic growth rate followed at 2.0%, exceeding that of blacks (0.9%) and whites (decrease of <0.1%). Overall, the U.S. annual population growth rate has held steady at 0.7% since 2011. Following a Hispanic population boom in the 1990s that was driven by immigration and high fertility rates, the Hispanic population’s annual growth rate peaked at 4.2% in 2001. It then started to decline as fertility rates fell and immigration slowed, a trend that accelerated during the Great Recession. While the foreign born accounted for 40% of Hispanic annual population growth in 2006, that share dropped to 34% by 2015. Fertility rates declined from a peak of 98.3 births per 1,000 Hispanic women in 2006 to 71.7 in 2015. While Hispanics continue to disperse across the nation (though at a slower pace than before the Great Recession), the nation’s Hispanic population remains centered in three states that drive much of the group’s population growth. California (15.3 million), Texas (10.9 million) and Florida (5.1 million) made up 54% of the U.S. Hispanic population in 2016 (state population data are not available for 2017). However, Texas grew faster than California, adding an estimated 233,000 Hispanics from 2015 to 2016 and accounting for 21% of the nation’s Hispanic population increase during this time. Hispanic annual population growth in California (176,198) and Florida (167,138) each accounted for more than 15% of the national total. Harris County in Texas, which encompasses Houston, added 39,639 Hispanics in 2016, the largest annual increase of any county in the nation. Maricopa County, Arizona, where the city of Phoenix is located, was next with an increase of 34,064, followed by Riverside County, California, with an increase of 29,167. Los Angeles County, California, which has the largest Hispanic population of any county at 4.9 million, had an annual increase of 22,061 Hispanics.